White House sources say the president is currently enmeshed in the digital fabric of the healthcare.gov site itself. WASHINGTON—According to an urgent report issued today by the White House, a terrified and frantic President Obama is currently trapped inside the healthcare.gov website. Early reports indicate the president inadvertently became physically enmeshed in the inner workings of the online health insurance exchange at approximately 11:48 a.m. this morning, and is at this very moment attempting to find any possible means of escape from the highly unstable and dangerous healthcare.gov internal network. 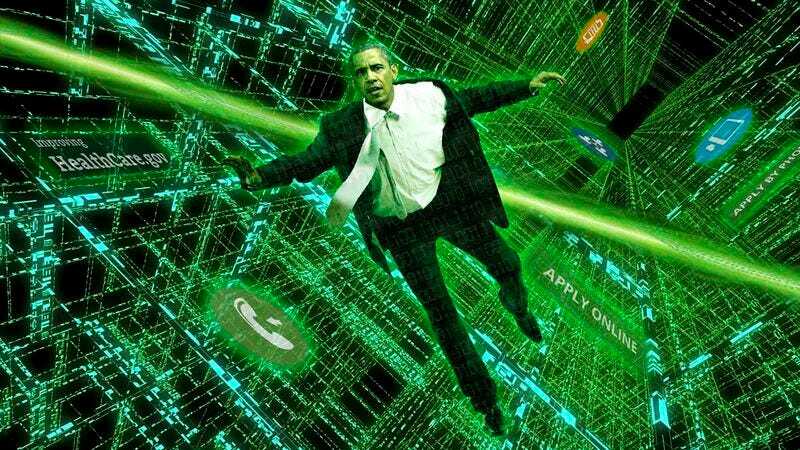 According to reports, Obama has spent the last few hours stranded in a dark, seemingly infinite three-dimensional insurance matrix made entirely of programming code, scrolling ones and zeroes, and indecipherable information about government subsidies, and has as yet been unable to locate a safe exit from the digital infrastructure of healthcare.gov itself. White House sources have confirmed that Obama is both alone and intensely frightened, and that the president may at this moment be endangered by the complicated, twisting data fields of healthcare.gov, as well as the terabytes of random eligibility notifications and policy cost estimations shooting in all directions. Further reports have warned that any hope of extracting the president from the online marketplace may already be lost. Reports confirmed that after finally forcing his way past the dense clusters of programming language tangled in the healthcare.gov help page, Obama finally reached a complicated system of virtual pipelines sending information about spouses and dependents directly into a pulsating golden orb. Upon reaching his hand into the orb, the president was said to be transported directly into the heart of healthcare.gov’s online marketplace. Obama was then reportedly horrified to find himself inside a crumbling software framework, surrounded by a chaotic array of randomly scattered premiums, out-of-pocket charges, and collapsed open enrollment architecture. “Please! Just get me out of here!” Obama added as the data grid below his feet shattered into millions of infinitesimal pixels and he plummeted into an infinite void of lost health care coverage. At press time, U.S. Health and Human Services Secretary Kathleen Sebelius had assured reporters that engineers are working around the clock to free the president from the healthcare.gov site by the beginning of December.